With awelded cast-steel framework, this hydraulic press isa must-have for any engineering workshop, repair firm, or technical training institutions. 10 hpmotor runs on220-volt 3-phasepower. 2 speeds and pressure regulatorlet you adjust to suit a given project. Cylinder moves left and rightwithin the frame for off-center parts. Effortlesslyadjust the height of the heavy work tableusing the hydraulic cylinder and lifting chains. 4.09” chrome piston with automatic returnsaves time after you’re finished applying pressure. Typically kept in stock forfast shipping. Delivery in accordance withCE standards. 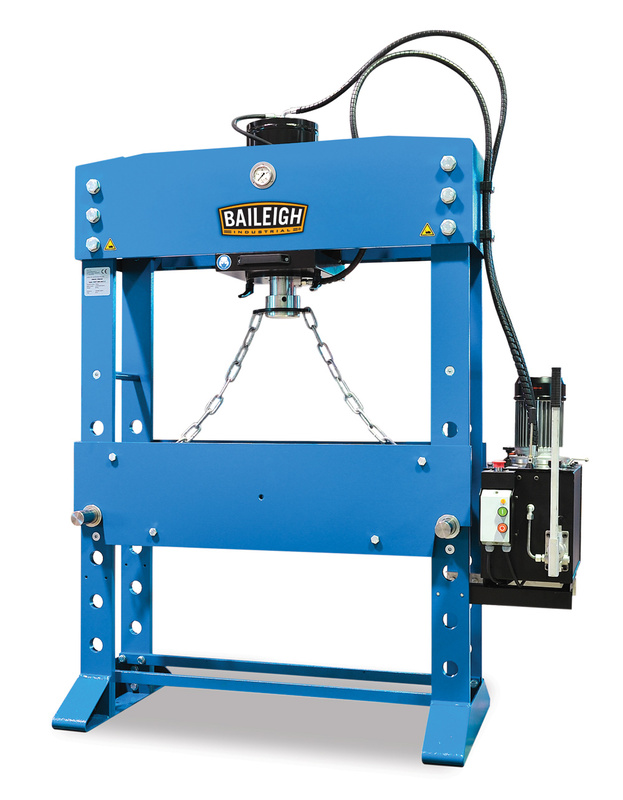 Baileigh covers this H-frame press with a1-year parts warranty. 90" x 37" x 84"